Before I start the second half a couple of Parish Notices. First of all I have regretfully had to turn comment moderation on. This does not mean I will be editing or refusing to post comments that disagree with me, but I don't see why anyone should have to see comments inviting me to take my own life before I get the chance to delete them. So please keep commenting - it makes the blog - they just won't appear instantly for the time being. Secondly some good news if, like me, you're a fan of the Short Set. Greater Anglia have confirmed that the Class 37 hauled set will be in use until at least early 2019 when the new fleet of trains arrive. The 68's are still due to go at the end of the year though but I must say I'm chuffed to bits over the 37's - far more nostalgia on the railways right now than there is in the bus world. And so to the second half of what turned into an epic day. If you haven't read the First Half click here. 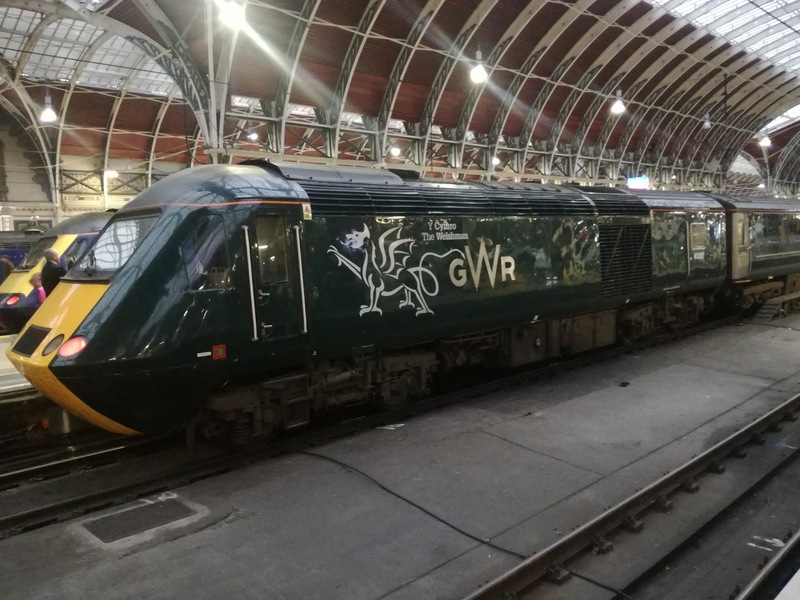 I arrived at Paddington with one thing only on my mind. After having the security forces come down en masse on me in Kent just for taking pictures of trains at an official viewing point designed for enthusiasts to take pictures of trains at I didn't want to be surrounded by SWAT teams for daring to snap an HST so immediately sought somewhere to sign in. Took me ages to find, which involved asking three members of platform/gate staff who couldn't have been friendlier, and in one case really bubbly and giggly. I eventually found the office, signed in with another really nice lady, attached my ID to my lapel which got me in and out the barriers at will and got to work. 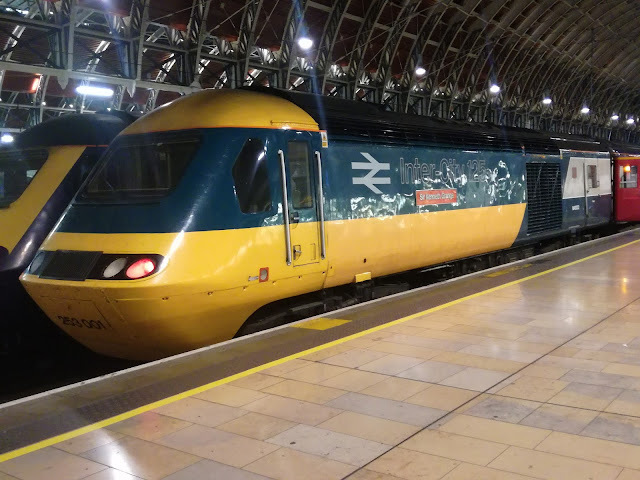 This was the first time I'd been at Paddington for a good 13 years, and certainly the first time I had gone there purely for hobby reasons. There is certainly far more than HST's to see there. Paddington is also the terminus for the Heathrow Express, a quick but pricey route that uses Class 332 Siemens EMU's that I have to say look extremely smart inside after their 2013 refurb, I have never seen 1+1 seating on a train before, and is it just me or can you see where the front for the Class 68 locos came from? Here is 332004. 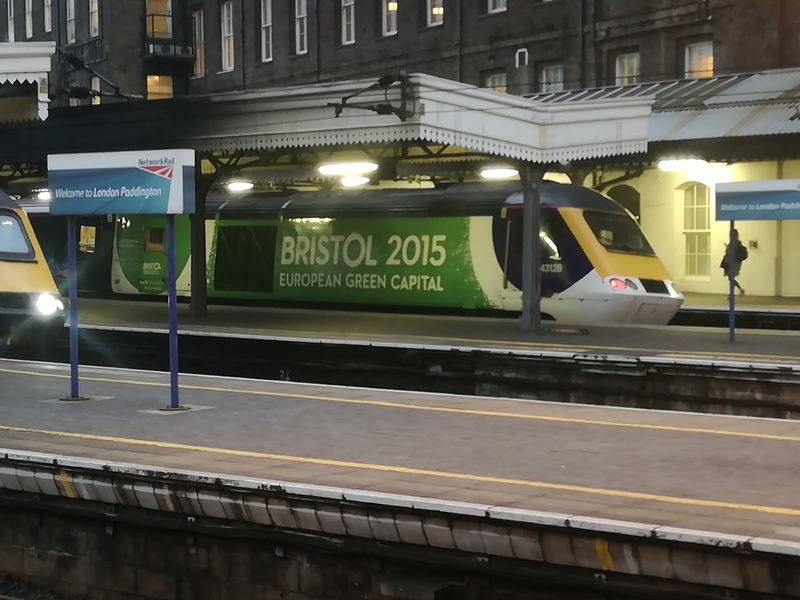 Now the sharp eyed will have noticed a train until recently unthinkable at Paddington. 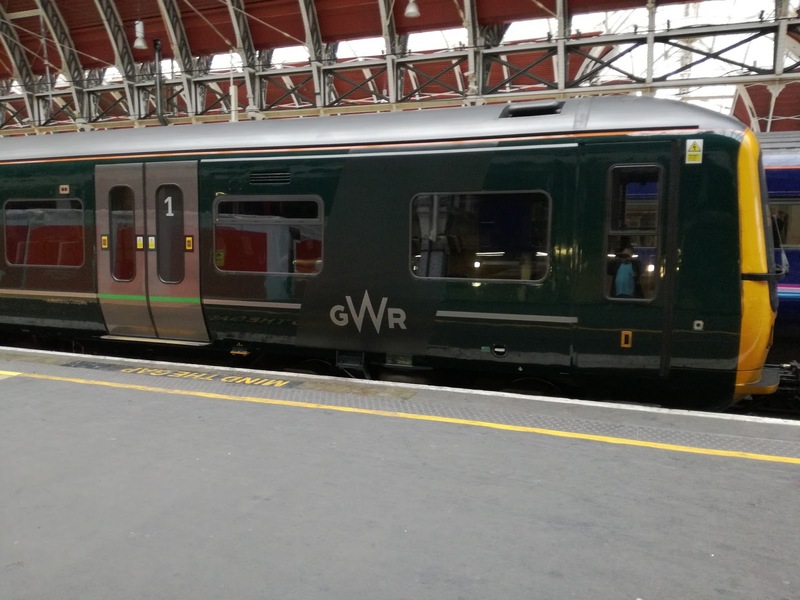 Great Western Railway are replacing their Class 165/6 DEMUs with brand new Class 387 Electrostars, now the GWR has been partially electrified. 387135 was standing out of service and was the only 387 I saw while I was there. I am quite a fan of GWR's new green and silver livery, and I think it looks just as good on the old 165/6's, which will be going South and West to replace the 142/150 DEMU's once all the 387's are in service. While we are looking at the new livery last Monday GWR launched it's new "The Welshman" service, and suitably decorated 43187/88 and a rake of coaches. So of course when I saw it on Friday it was about to leave for Penzance. Made perfect sense! Have to say looks good though. GWR have realised the photogenic potential of the HST's just as TfL have the Borismasters, and there were a couple more examples on show. 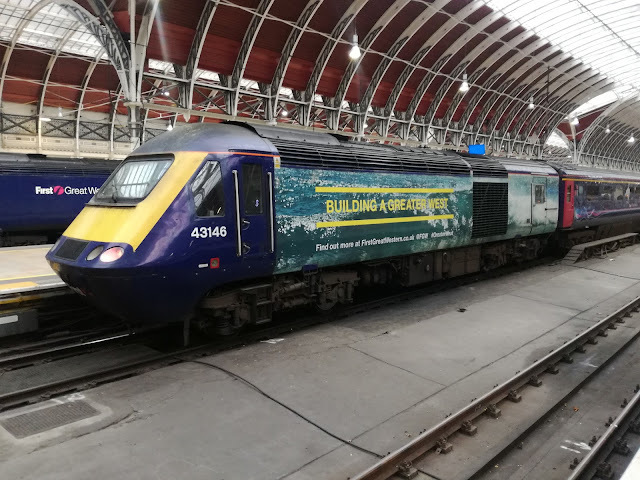 First of all here is 43126 extolling the virtues of Bristol. 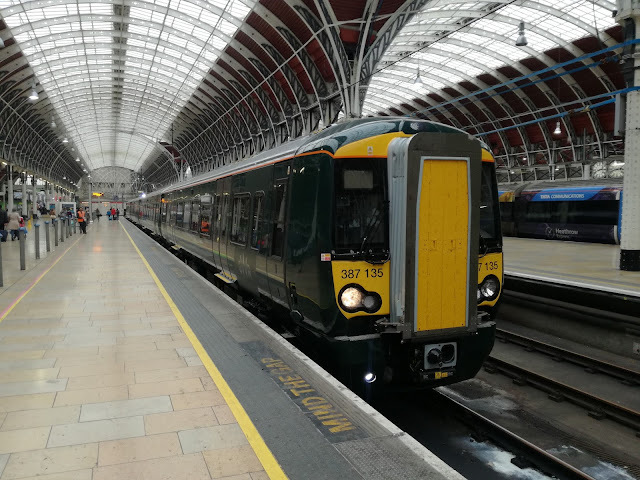 The biggest surprise I had at Paddington was a service I didn't know existed together with rolling stock I wasn't expecting. To be fair it's only been running 11 years and as I haven't been to either Paddington or Heathrow in that time I forgive myself even if no one else will. The Heathrow Connect is a stopping service from Paddington to Heathrow, taking 15 mins longer but far less from your wallet, using 5 car Class 360 Desiros, which I thought, in my ignorance, were only to be found on the GEML. 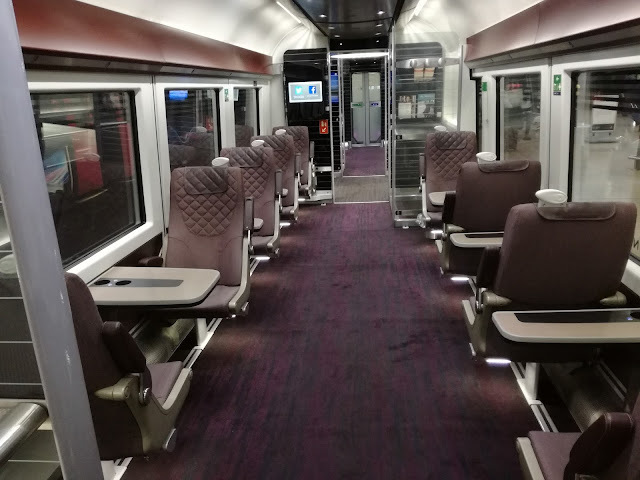 Not so, as Heathrow Express also have one 360 for the Terminal 4 shuttle. Now I need to thank someone. My main aim was to see two very special HST's. GWR were unable to tell me where they were but Leo Martin, who I met on Railcam did. Thanks to Leo I was at the right place at the right time to catch firstly 43185, recently repainted in Intercity Swallow livery (not sure if African or European swallow for Python fans) and then what I regard to be THE Holy Grail on the railways right now, 43002, painted in original BR livery and named Sir Kenneth Grange, the genius who designed these remarkable trains. I owe you, Leo, couldn't have done it without you mate. Yes of course there's a video of them both arriving at Paddington, which is where Leo needs all the credit, as it was from his info I was able to be on the right platforms. I'll put many more pictures up on Flickr when I get round to it! I would just like to thank all the lovely people at Paddington, a really friendly station. In the meantime I made my way home which included an extreme game of sardines on the Jubilee line, and reflected on quite a day. 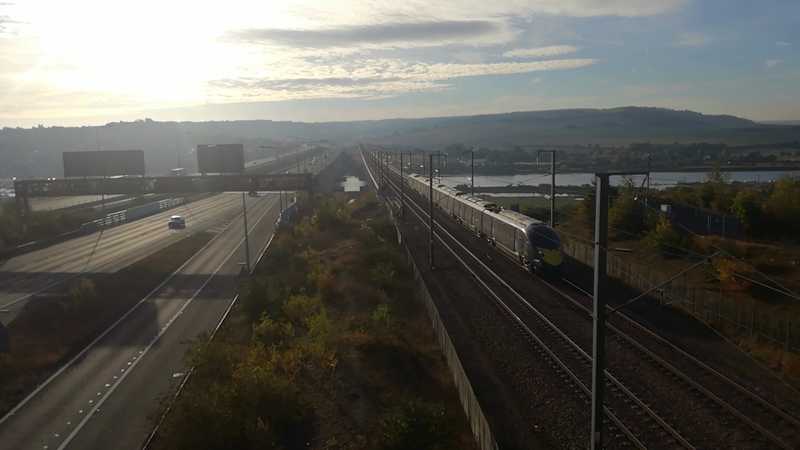 This was going to be a classic day, all worked out - start by returning to the observation point at the Northern end of Medway Viaduct on HS1 to hopefully see my first e320, and get some good pics to try and win the elusive Network Rail #DailyPick photo competition, then travel up to Paddngton for some serious HST spotting. I'm lucky that the observation point, purpose built for enthusiasts, is visible from my Mum's house, so literally a 2 min drive away. It is surrounded by extremely busy roads though so you need quite a strong nerve to stand where I did for my first few vids and pics, but my word it was worth it. The Winter sun was out and providing a great contrast of lighting depending which side you were standing. After that what has to be said impressive sight I went down to the observation point where you can get really up close and personal to the trains hurtling past you. Remember that point as it will be relevant in a while. First up was a 12 car Javelin, which seemed far better than a 6 car for some reason! There was some time before the next train so I explored the path to see what other angles could be achieved. I discovered the path went down, underneath HS1 with views of the Chatham Mainline, and up the other side giving quite magnificent views of the Medway Valley. 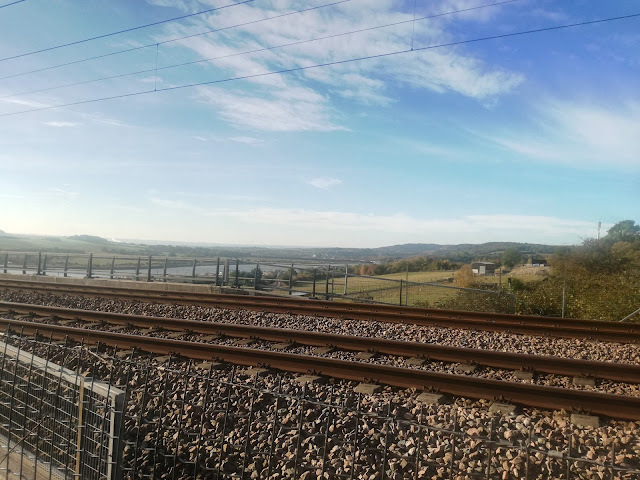 I decided a train on the edge of this view would be quite something, so after a test pic I monitored the real time train tracker and waited. At this point events took a rather surreal turn. I looked up and saw two uniformed Police officers coming down the path on the opposite side. Instinct told me why they were there, so I waved, pointed to my phone and shouted I was taking videos, Unfortunately the traffic noise from the M2 totally drowned me so I indicated I would come back round to their side. When I got there this extremely pleasant Transport Police officer informed me they had had reports of a trespasser lineside. Maybe at this point I should say the above pic was taken with my hand up at full stretch to get the camera higher than fence level! My initial concern was that the site wasn't as enthusiast dedicated as I thought. However, the officer confirmed that yes, I was doing nothing wrong being where I was and indeed it was a spot designed for the activity I was undertaking. So with no crime being committed, or suicide threatened we had a good natter, shook hands and off he went. I turned round to go back to my original location on the other side and immediately saw two Police cars stopped on the M2 right by me obviously waiting to close the M2 should I have been a potential jumper. A slight overreaction to an enthusiast taking pictures at a dedicated enthusiast spot? I have enormous sympathy for anyone who sees the only solution to their problems is jumping under a train. However to my knowledge no one who has taken that ultimate and tragic step has ever taken pics of the trains beforehand. 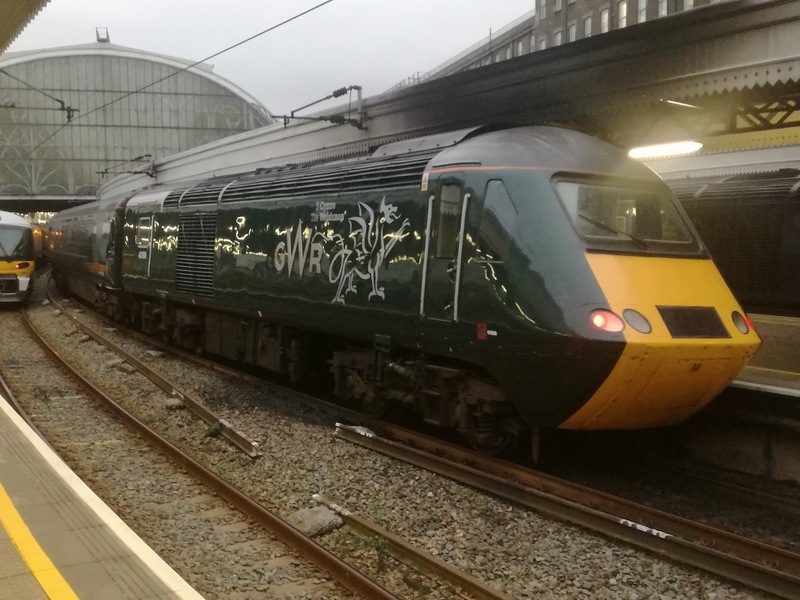 I never did get the pic I was after due to a 373 having technical probs, so I gave up as time was getting on, and went back to the other side to come face to face with a lady from Network Rail who was also checking I wasn't about to end it all. Again she was very pleasant, really interested that I had access to live running diagrams, and in fact we nattered too long as I missed a perfect opportunity to get two Eurostars passing on the bridge. The last train on the video is of the troubled 373 just after another one hammered the other way. I am very grateful everyone cared so much, but at the same time hope no one was being burgled at the time as I would think the Police response may have been delayed due to lawful activity taking place elsewhere. Anyway here is the vid compilation, enjoy the whoosh of the 373's as some of them are being scrapped, and of course because of the number of Police man hours involved in the production! It was then time to go to Paddington. 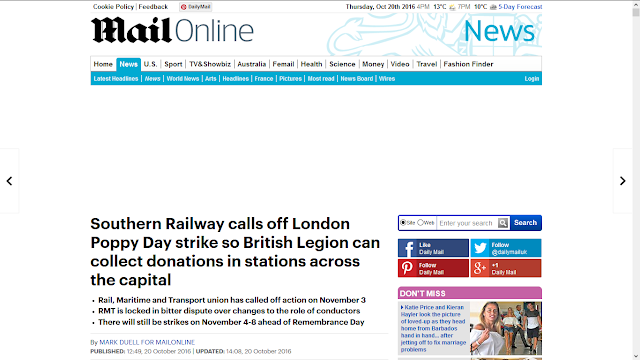 The intention was to drive to Bluewater, leave the car there and then bus it to Paddington. I managed to find a parking space 20 yards from the Bus Station and got my first surprise. 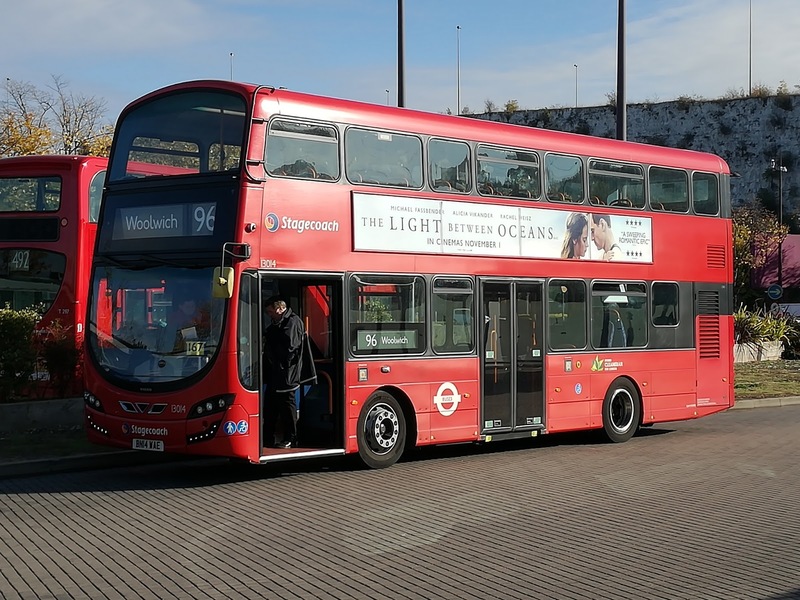 The 96 from Bluewater to Woolwich is normally operated by E400's or hard seated Scania Omnicity Deckers. However waiting on layover was a Gemini3 Volvo B5LH. Holy cow did it rattle! Not very good for a bus less than 3 years old. But that turned out to be the least of my problems. Crayford Hgh St was closed due to a burst water main and we had to detour around a closed section of about 500 yards. The diversion took 45 minutes, no exaggeration. 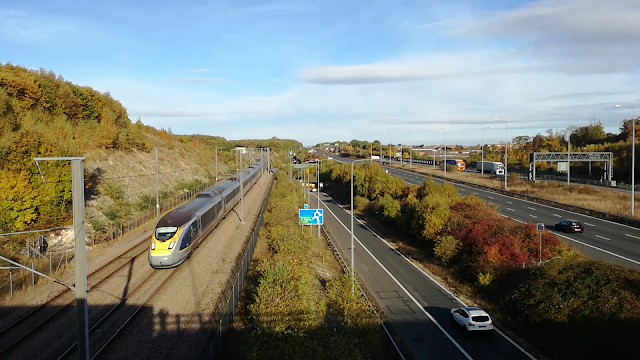 It involved doubling back halfway to Dartford, going to the A2, heading London bound to what was the Black Prince at Bexley, then doubling back again to Crayford in appalling traffic. Had TfL shown any foresight we would have gone straight to Bexleyheath and a shuttle service between Crayford and Bexleyheath would have saved many people massive delays. As it was we were so late the bus terminated at Bexleyheath and we were all rather unceremoniously chucked off!. It was obvious I wasn't going to make Paddington by bus, so a change of plan was needed. 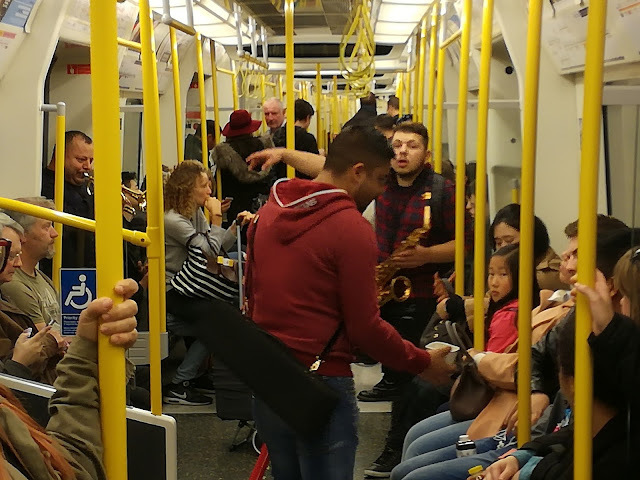 I caught an 89 to Lewisham - a 61 reg E400 that was considerably less rattly than the Gemini - finally invested in an Oyster card, caught a Southeastern 465 to Victoria and jumped on the Circle Line to Paddington, only to be serenaded by what I have to say was an extremely good jazz band most of the way. 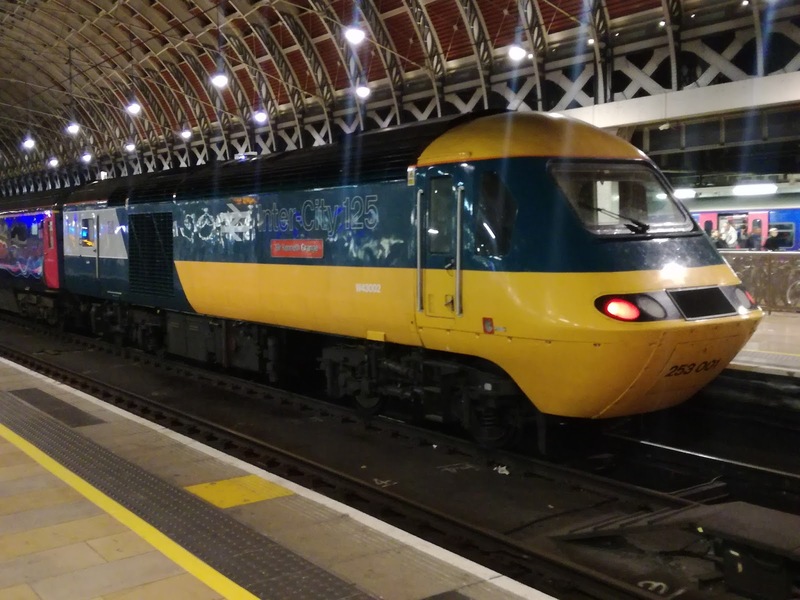 At precisely 1427 I stepped onto the concourse at Paddington for the first time in 13 years. 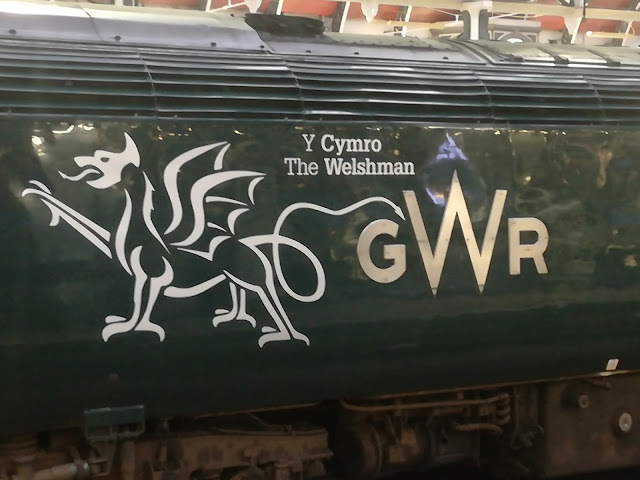 In the Second Half I'll review my afternoon there, with some unexpected trains, some impressive trains, I get to meet Sir Ken and some really friendly folk. PS - despite best efforts didn't win the photo comp! Currently down in Kent providing post op care for the woman you can all blame for my existence, and had enough time to nip down to East Kent and finally ride a couple of the Scania E400MMC's I first saw in March - see here - and meet up with my old pal Matthew, who has gone up in the world yet again becoming Commercial Director of Stagecoach Southeast recently. Always a pleasure to catch up and it just doesn't feel like 35 years ago we were serving detention together for nattering about buses too much in Maths! 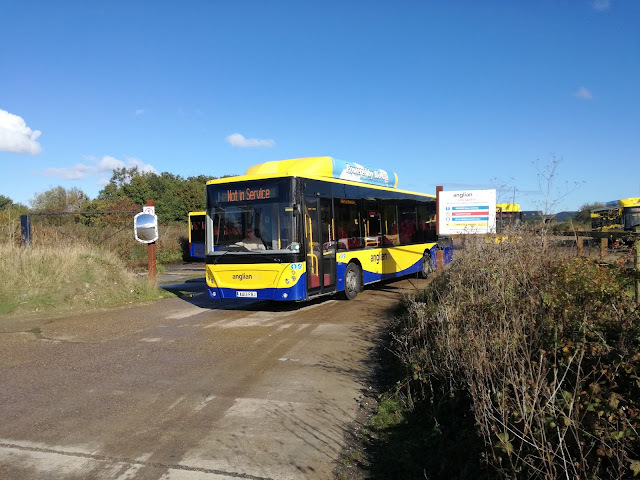 Anyway the main point of the afternoon was the MMC's, and so I parked up in Whitstable (Peter Cushing used to live there), and waited for the first "Triangle" bus to turn up. 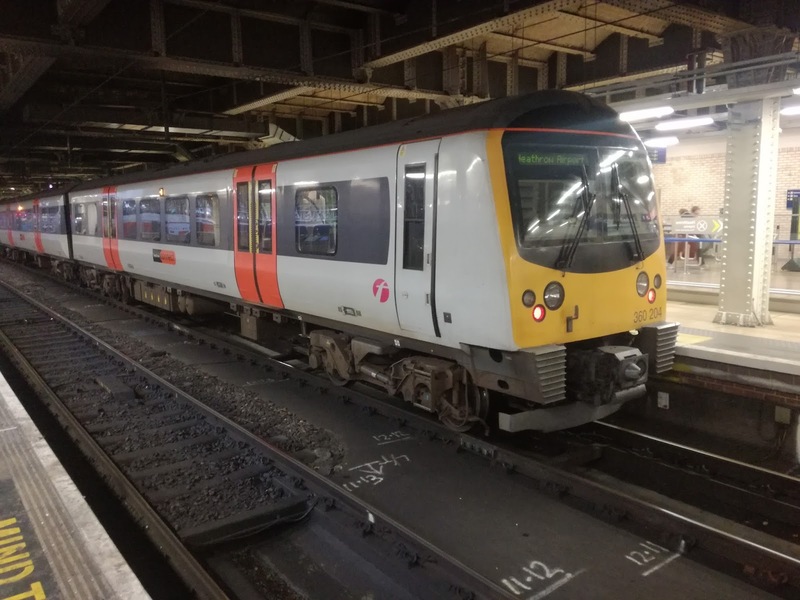 The "Trangle", as it suggests serves three towns, well two towns and one city, those being Whitstable, Herne Bay and Canterbury. 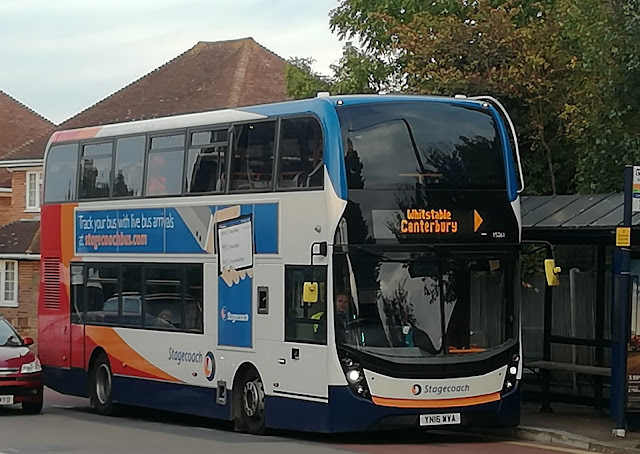 My first journey was from Whitstable to Canterbury, and it wasn't long before Stagecoach Scania E400MMC 15283 YN16 WVZ pulled up. These buses are nice places to be. Stagecoach haven't gone e-leather crazy like other operators, except for their Gold services, and even then they've got the leather and comfort right. the seats on these MMC's are the same seats you get on Megabus Plaxton Interdecks to Aberdeen or Barcelona, so a 25 min journey passes in extreme comfort. Note the low windows unlike the Streetdecks so young children can see out and sit properly. But what is the ride like? Well first of all I had to check with Matthew that these Scania Engines are Euro 6 - they are - because the acceleration and torque is by far and away the best I've ever experienced from a Euro 6 engined bus. There is a good reason for this. It's big. You can't let out the spare space in the engine compartment as a self contained flat on these like you can on some Euro 6 engine bays, and the results are pretty obvious. Smooth gearbox, gentle brakes, a quieter air chill unit, although still effective as my second bus got decidedly chilly. So we have a great bus so far, but the astute among you will have noticed I haven't mentioned rattles yet. This is because I'm not quite sure what to think. There were more rattles than I expected, and normally the scalpel would be out and I would be making some very cutting remarks. However, there are mitigating factors, as I shall explain. 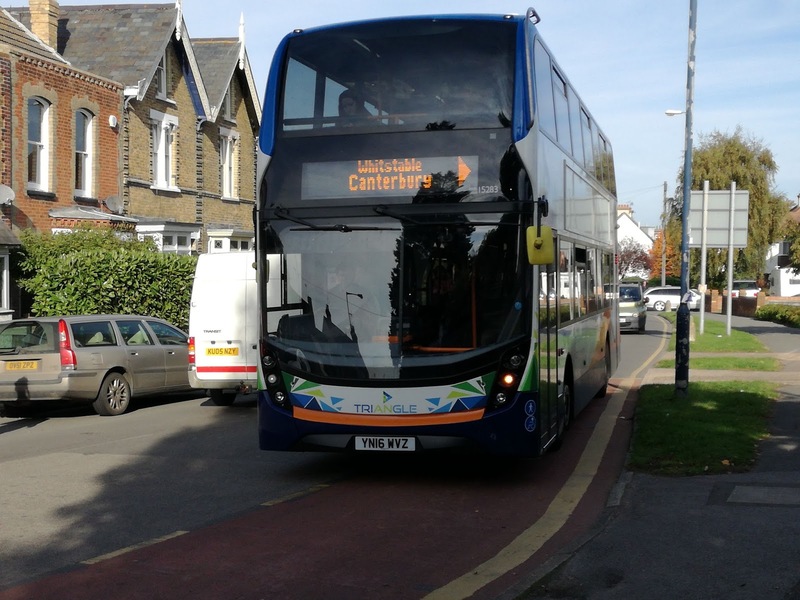 Most of you will know that in Norfolk I don't rate a bus until I've been down Gorleston High St on it, the worst road in East Anglia which rearranges your skeleton every time you go down it. In the last couple of days I have realised that Kent has become a county sized Gorleston High St. The roads in Kent are APPALLING!! My car doesn't have a rattle on it, as you would expect, but even that has been shaking the life out of me since I've been down here. Kent's roads were never as smooth as glass but now they are scarily bad. So it's not surprising the MMC's are rattling more than expected. But it also occurred to me that the Olympians lasted 20 years on those roads and still weren't rattling at the end, and that thought only muddied the issue. But I'm going to side with the buses on this occasion. When there was a smooth bit of road the ride was quiet, and I could text perfectly easily. On the majority though texting was very difficult and it really wasn't very pleasant, but that was down to the roads. If something isn't done and soon then in another decade Kent is going to be impossible to drive in - thought the Southeast was meant to be rich! Anyhow I completed the triangle on 15261, which I noticed wasn't branded, and drove home covering probably 5 or 6 more miles than necessary avoiding potholes. On a side note I spotted a Streetdeck on the 700 Bluewater - Chatham service last night. 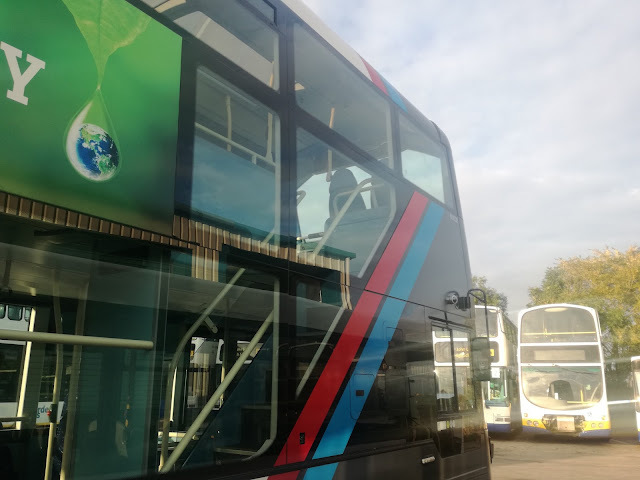 Having made inquiries as to if Arriva had bought a fleet of them to replace the 04 reg B7tl's currently on the route I discovered the Streetdeck is in fact a demonstrator and isn't exactly covering itself in glory. 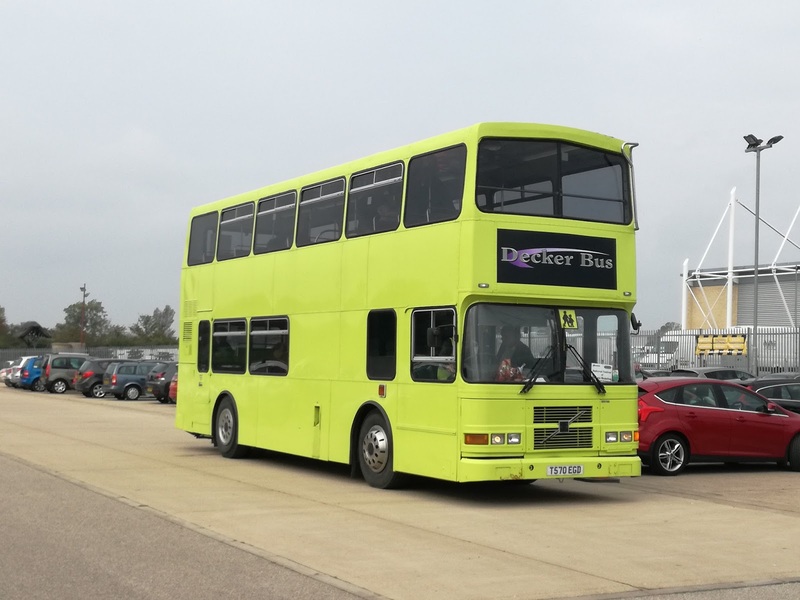 Some of you will know I grew up here in the Medway Towns, which was considered so demanding National Bus Company sent their demonstrators/prototypes here for evaluation. Metro Scanias, Volvo Ailsas. Metrobuses, Dennis Dominators, Bristol VR's all successfully negotiated Medway's undulating landscape. It seems, though, that the Streetdeck has been unable to follow in those illustrious tyre tracks, and it's lack of power has seen it unable to cope with some routes. There's progress for you! 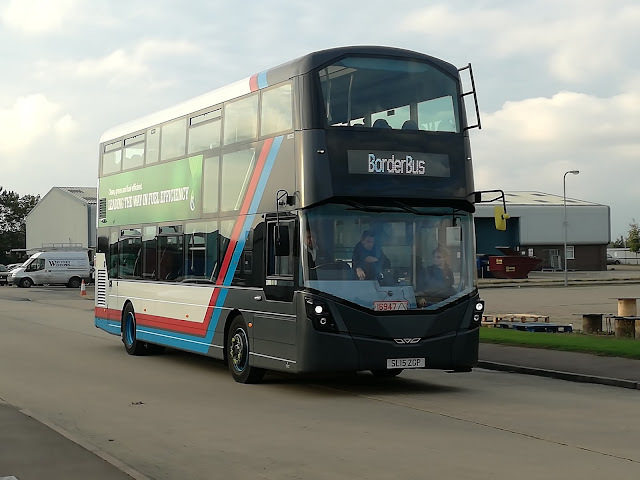 Rather backs up my opinion on Monday of the Streetdeck currently at Borderbus. Finally a little taster for you. 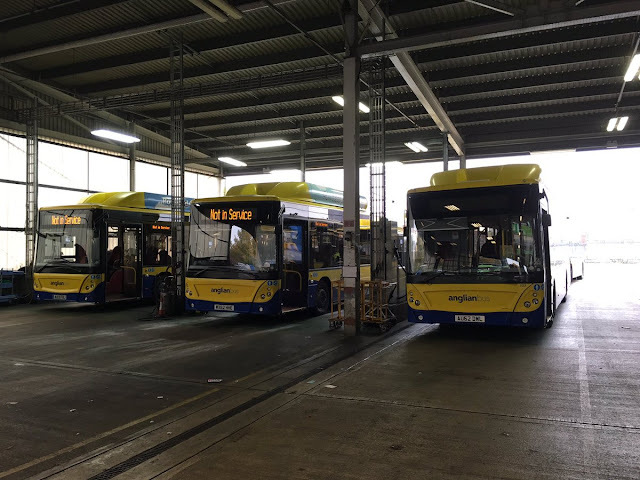 I will be publishing at least a couple of posts commemorating the recently departed gas buses, but I hinted I might have something a bit different and I'm pleased to say Dave Marshall, who was Chief Engineer at Anglian when the gas buses arrived has come up trumps, and sent me a mountain of pics of the gas buses in at the MAN factory in Portugal. It's going to take some time to sort through them all, which probably won't happen until I'm back in Suffolk, so here are a couple to whet the appetite. Dave you are a star, and I'm going to really enjoy compiling those posts. First of all a message for Mrs Borderbus, who informed me today she doesn't bother reading train posts - although there is a loco pic below this is a bus post so carry on reading!!! In the seedy world of rail enthusiasm all locomotives have a nickname - Class 66's are "sheds", Class 37's "tractors" and so on. 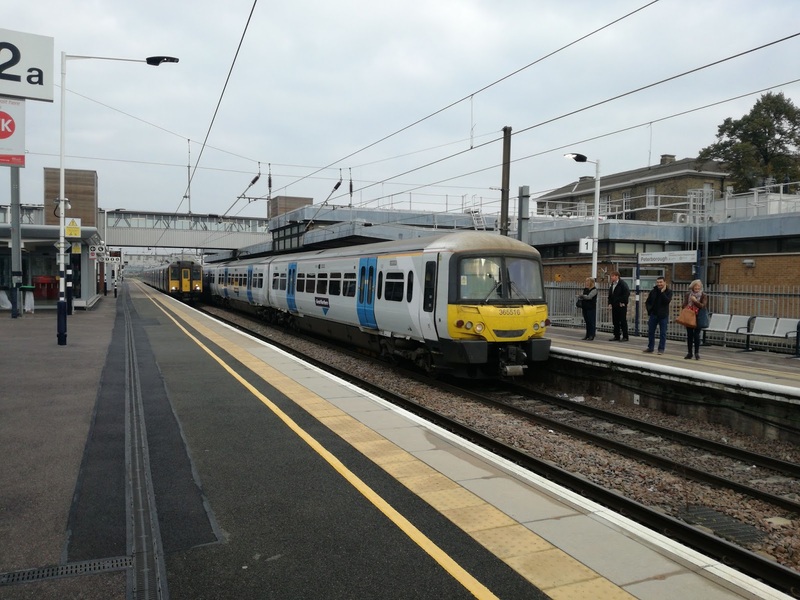 Below is a picture of a Class 70, known as a "Fugly". If you need that translated you have a sheltered life and I have no desire to corrupt you - suffice it to say it's not complimentary. 70014 at Ipswich being bombed on the left by Ipswich Buses! 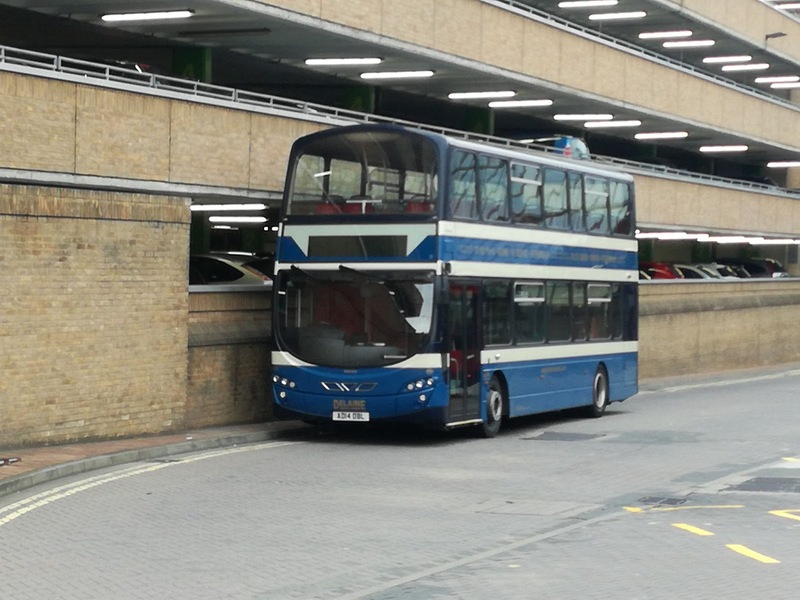 Now for some reason buses don't have nicknames, probably due to a lack of imagination, but if there was a "Fugly" of the bus world surely the Wright Streetdeck is it. Yesterday Borderbus took a Streetdeck demonstrator on loan for a couple of weeks, and it has to be the ugliest bus I've ever seen - it even makes Norwich's pink ones look attractive! Now long time readers will know I'm not exactly a fan of the Streetdeck. Every time I go on one I'm left feeling somewhat underwhelmed. However, being the eternal optimist I always think I've just been unlucky and the next one I go on will be better, just like winning the lottery. And so I gave this Streetdeck a clean slate, once my eyes had come out of shock, and tried to find some positives. I succeeded! On this Streetdeck the staircase has been opened up with light, windows now dominating the offside. This is all well and good but just a couple of questions. Firstly if you are a group of ladies on a Friday night out you will NOT want to go upstairs as that staircase will reveal all to anyone who happens to be passing. I'm not sure that design came from a woman. Secondly, and this came from Mr Borderbus, the upstairs windows are narrower to apparently save weight. Replacing half the offside with glass isn't going to do much to help that weight loss. And it's not just the offside that has seen new glass - so has the roof. 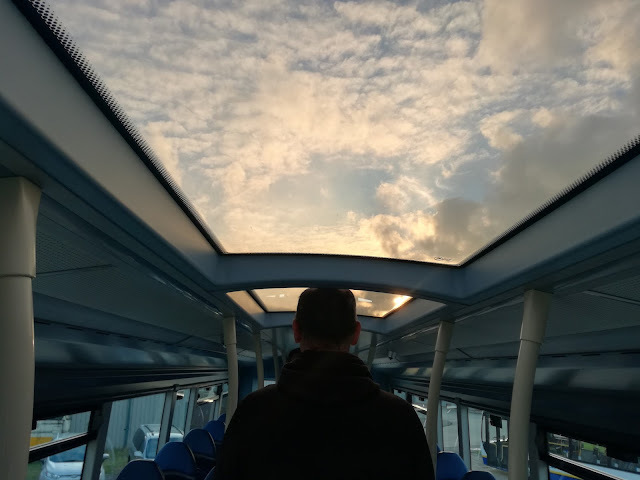 Two glass roof panels adorn the front of the top deck. Nice idea, or at least would be if it wasn't for a minor detail. I'm not the tallest on the planet, but anyone taller than me is in peril, as demonstrated by my glamorous Borderbus assistant. If we refer back to that Friday night out, assuming you're in a place with late buses on a Friday night, you've had a few light refreshments, stagger upstairs to exhibit yourself to pedestrians on the offside, and then split your head open because the glass panels are higher than the rest of the roof with ridges in between that need either yellow and black tape or foam strips. The roof is low anyway but to have uneven heights is asking for trouble. 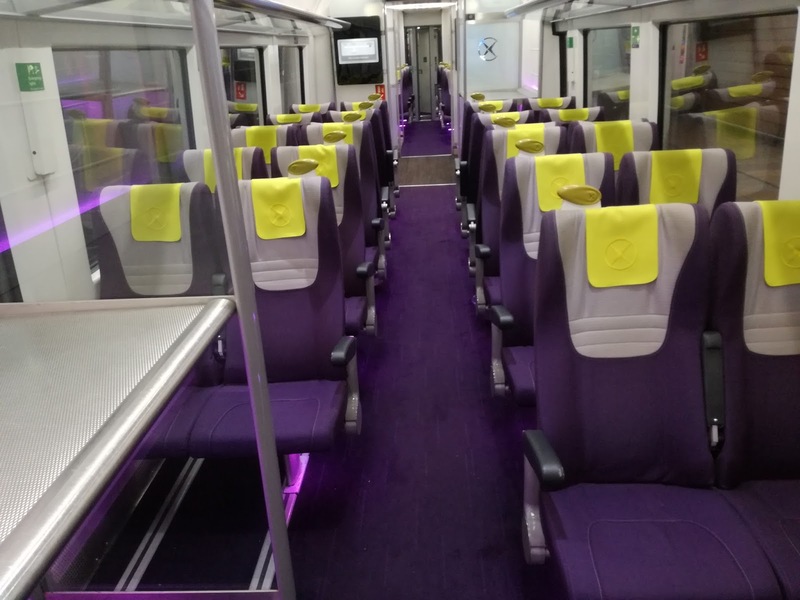 The side windows are too high for young children to see out of properly, and then when I tested the bars at the front meant to protect me in the event of a collision it turned out if I was thrown forward my gullet would be pushed out the back of my neck by the bar. Thanks. Note the bus hasn't even started moving yet! 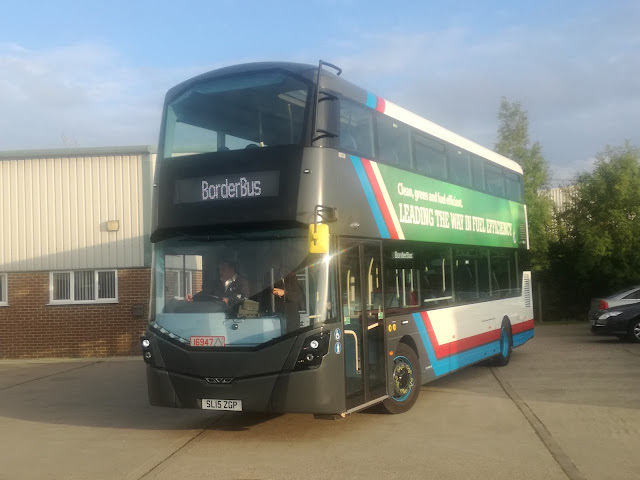 As usual when Borderbus get a demonstrator I was taken on a ride, accompanied by Mrs Borderbus and the Heir to Borderbus. We all noted the same thing, power, or lack of it. The Streetdeck is horribly slow pulling away, which is going to make life difficult for drivers wanting a quick getaway from bus stops. Mrs Borderbus and I said at the same time pulling away from Thurton with a decent load is going to hold a lot of traffic up. Overall the ride was bumpier than the Metrodecker, and there is a feeling of cheapness all around, far too much blue scratchy plastic everywhere, and displaying the opposite of the thought put into the Metrodecker. It doesn't feel as solid as an E400MMC, and yet again I struggled to find anything to like about it. Apparently these are not cheap buses. They certainly feel it. 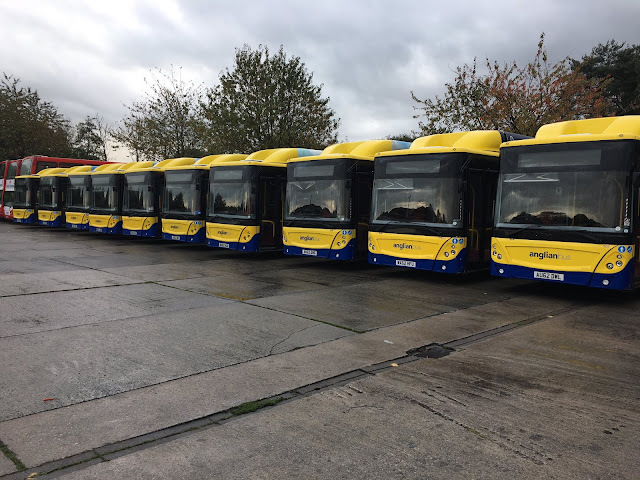 I can report that all of the working ex Anglian gas buses have arrived in Plymouth. I'm grateful to Martijn Gilbert, supremo of Reading Buses for allowing me to use his pictures of the convoy refueling early Monday morning. I can also report that Anglian suffered problems yesterday due to vehicle shortages, and their fares go up today. Wasn't even worth opening a book on that was it. 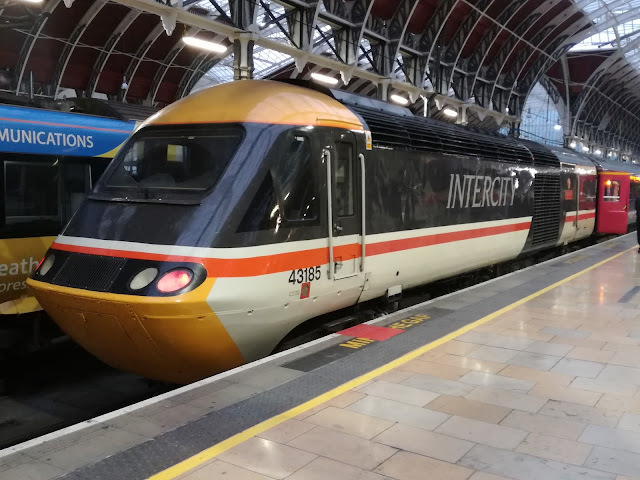 I'm down in Kent for a few days now, but hope to squeeze a couple of trips in, the Scania E400MMC's being a priority, and as long as engineering works don't make it pointless I'm hoping to get to Paddington on Saturday for some HST photography. 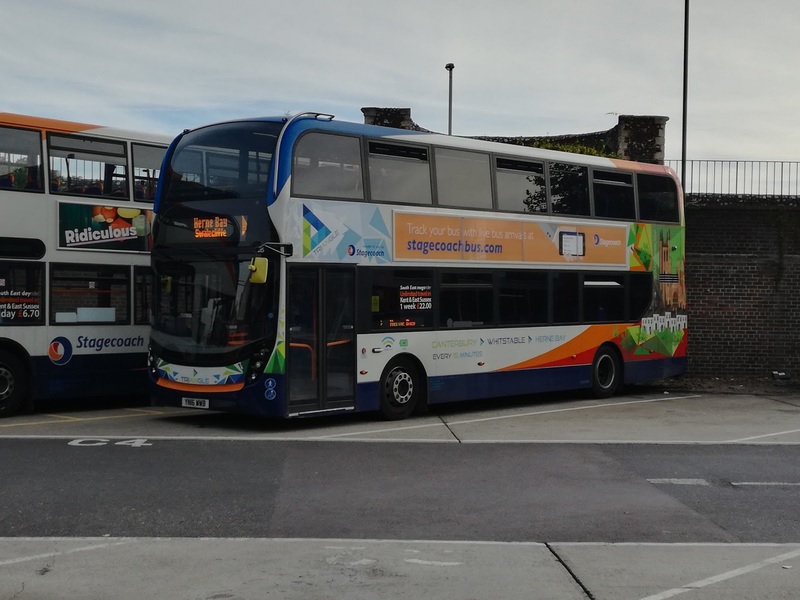 If anyone is in Beestons territory they have the Orange Metrodecker for 10 days starting yesterday, so try to grab a ride on it if you can. Oh well that's it. The most unique fleet of buses in the country has gone West. 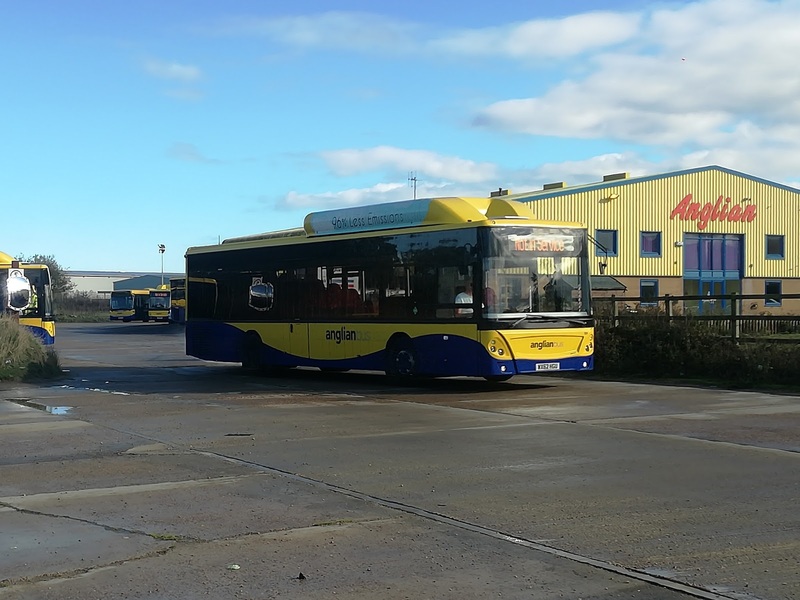 South West to be precise as this afternoon the 12 MAN Ecocity gas buses left Anglian Bus to begin a new life in Devon at Plymouth Citibus. Myself and Tim were at Ellough to witness the departure. No words are needed so enjoy the pics and videos. A commemorative post will be published soon, hopefully with some exclusive pics never seen before of their initial construction. A word of thanks to the Plymouth drivers who collected them today - it doesn't show on the videos except when Tim's arm appears, but nearly all the drivers acknowledged us as they left - a nice touch much appreciated. 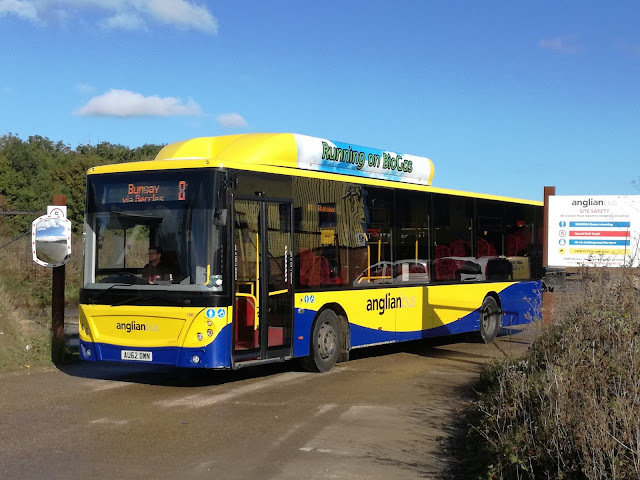 Anglian have reinstated all the Scania Omnicities and Omnilinks previously withdrawn, as well as Trident 712, which has had more lives than a cat. 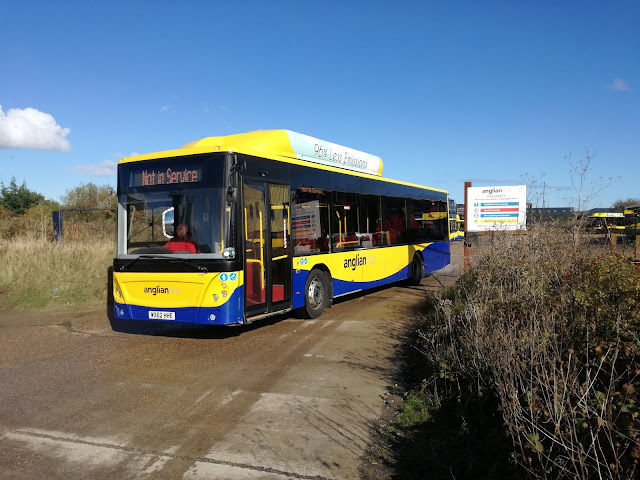 And so East Anglia plunges back into the Dark Ages, with nothing to suggest the 21st century exists - no gas buses, electric buses, even hybrids, no MMC's, no B5's, nothing except a few pink Streetdecks which are hardly trailblazers in the future of bus travel. An era has ended, a sad day indeed. Those three left in front of the remaining 9, who left the yard and then rather pleasingly assembled outside before leaving in convoy. 106 was the last to leave the depot, although it headed the convoy away. For the record the order leaving the yard was after 101, 110 and 103 was 109, 107, 108, 111, 105, 102, 100, 112 and 106. So long, farewell and thanks for the memories. I will come and see you in Plymouth. In Part One I looked at the somewhat mundane bus scene in Peterborough. Now to the rail side, which certainly from a personal point of view was far more interesting. First of all I had to get there, and I decided to really take the plunge and catch the first train out of Lowestoft, This is because of what was operating it. No, not a short set but an anomaly that occurs six days a week, but is far too early for your average enthusiast. 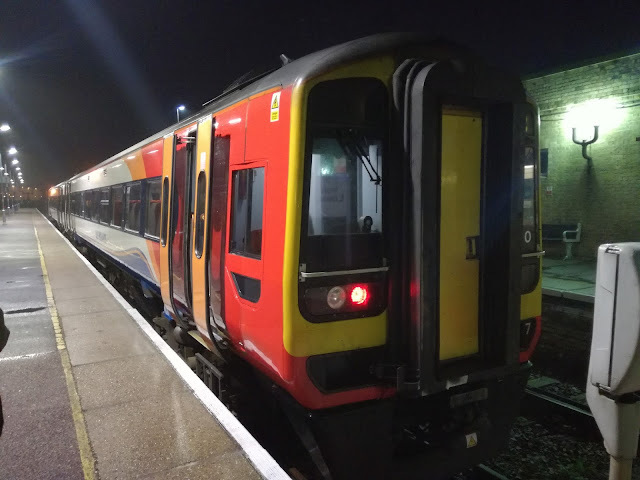 The second train to Norwich on weekdays, and first train on Saturdays is operated by an East Midlands Trains Class 158, which then goes on to form the 0757 from Norwich to Liverpool. Quite why this is I have no idea, but since it meant I could stay on it at Norwich and not have to change it seemed the obvious thing to do. So I arrived at Lowestoft to see the odd sight of an East Midlands train as far East from the Midlands as it's possible to get! I confess to liking 158's. Always have done and this one was no different, fast, quiet and smooth. 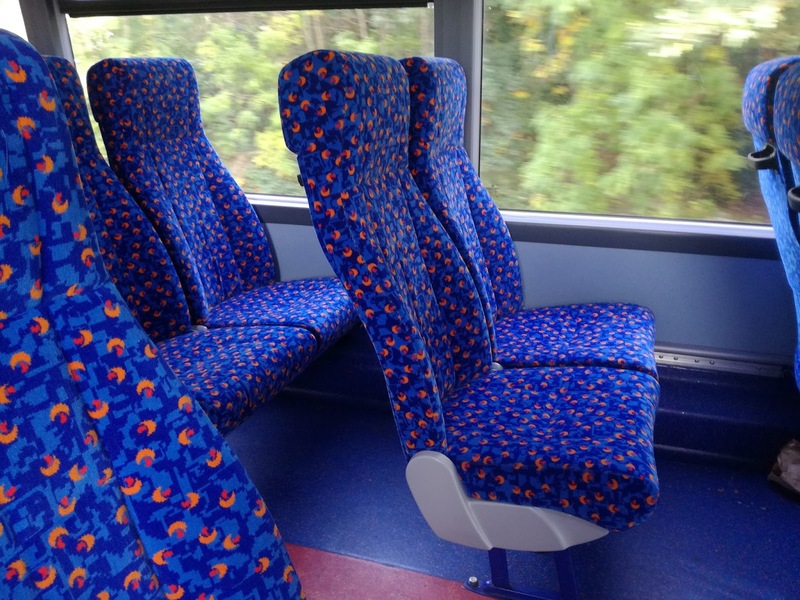 Have to say though EMT need to look at the upholstery - some of the head rests on the seats looked decidedly grubby. 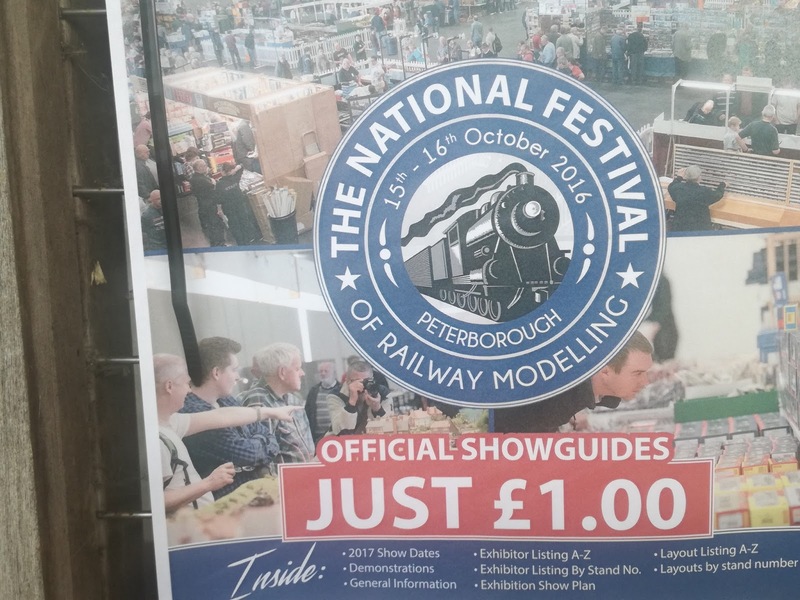 Anyway before I knew it we had steamed, well dieseled, through Thetford Forest and across the Fens and had arrived at Peterborough. Someone is bound to correct me here but to my reckoning Peterborough has seven different operators passing through it. Greater Anglia, EMT, Crosscountry, Virgin Trains East Coast and Great Northern all stop while Hull Trains and Grand Central pass through without stopping. It was Great Northern that had a personal interest for me. Apart from the soon to disappear 317's and 319's there are also the Class 365 Networker Expresses to see. 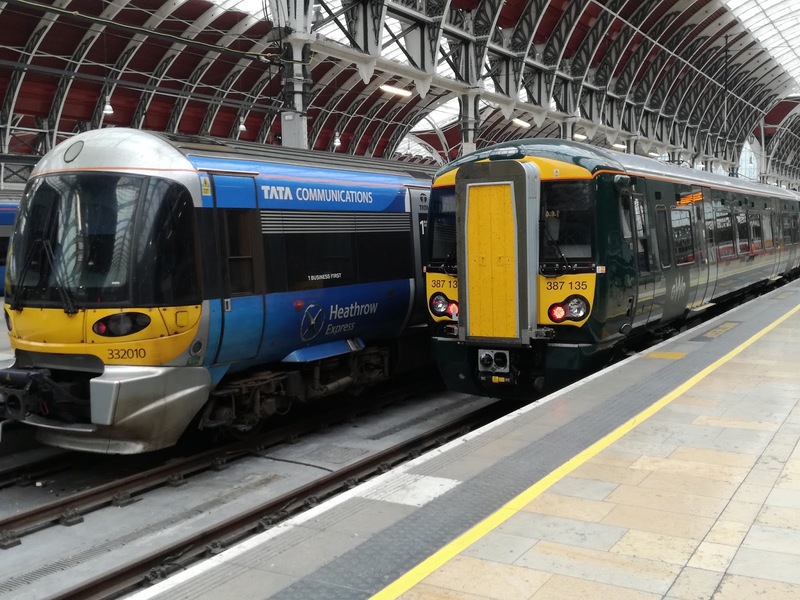 15 years ago I was working some of these trains for Connex Southeastern, before they were replaced by Class 375 Electrostars and returned to Great Northern. Now history is about to repeat itself, as Class 387 Electrostars are cascading from Thameslink and ousting the current stock. 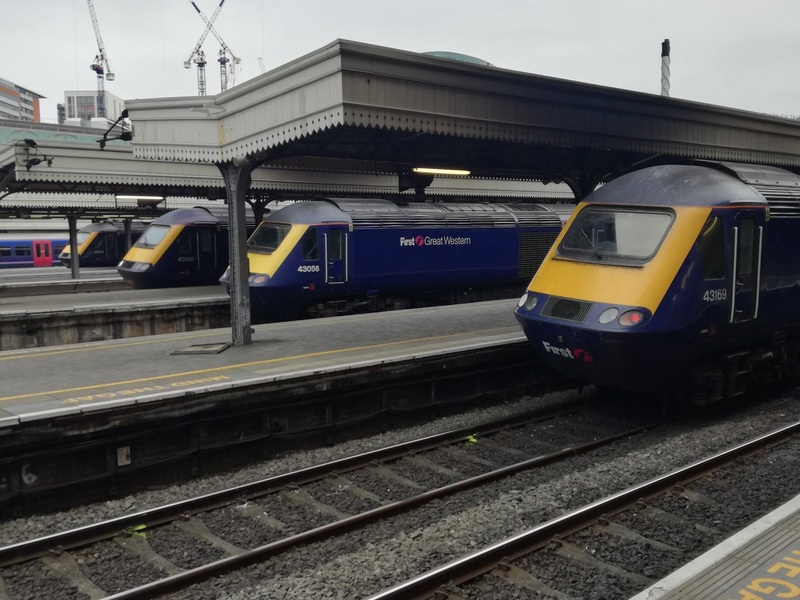 The 365's were destined for Great Western, but the new Electrostars there has put pay to that idea. The 365's are highly underrated trains and there must be use for them somewhere. Here is 365516 looking a bit different to 15 years ago, with a 317 at Peterborough on Saturday. I have happy memories of the 365's and later when 365508/15 came in together, a combination I would have worked many times I did get rather nostalgic. Just a shame their interiors look more like hospital waiting rooms now than the cosy, warm interiors they had originally. However there were other attractions to be seen, and just after I arrived it was announced a charter train was going to stop en route to Scarborough. Excellent, your trusty reporter thought, steam? 37's? 47's even? Sadly no, nothing nearly as exciting. A pair of sheds, Class 66's to normal people. Slight anticlimax there! Looks so wrong doesn't it! 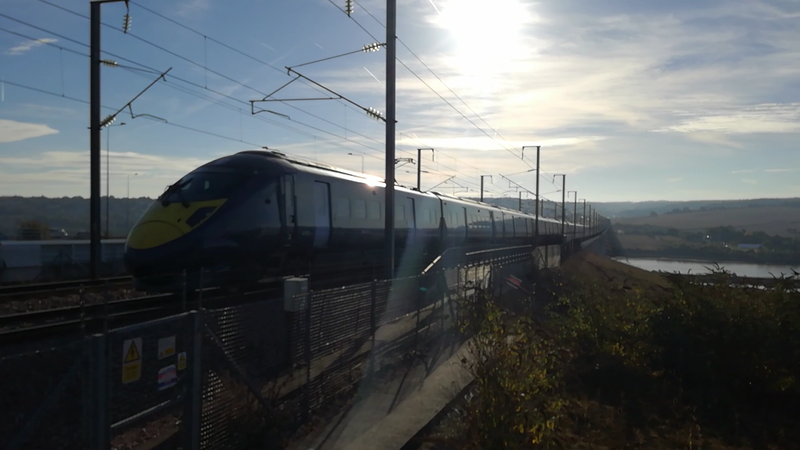 Now obviously you would expect me to have a video of the HST's and the pic above is a still from the video I took. I have combined the videos i took of the two HST's and a couple of Hull Trains 180's flying through into one video, which you can see below. There was also one other treat in store. 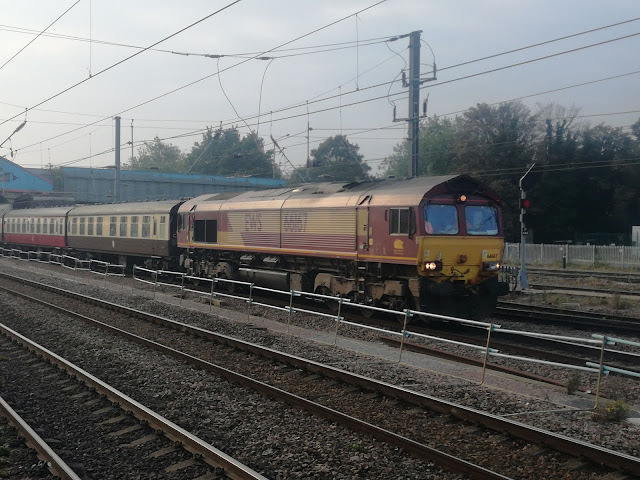 It would appear that D6757 enjoyed my review and praise of it so much it followed me to Peterborough, this time on the rear with 37419 leading, and gave a bit of a show as it made its way out. The sun was out again and at last I saw this beauty in all her glory. You can have all the Diesel Galas you like, and of course they have their place, but nothing, I repeat nothing beats seeing these magnificent machines out on the mainline still earning their keep. 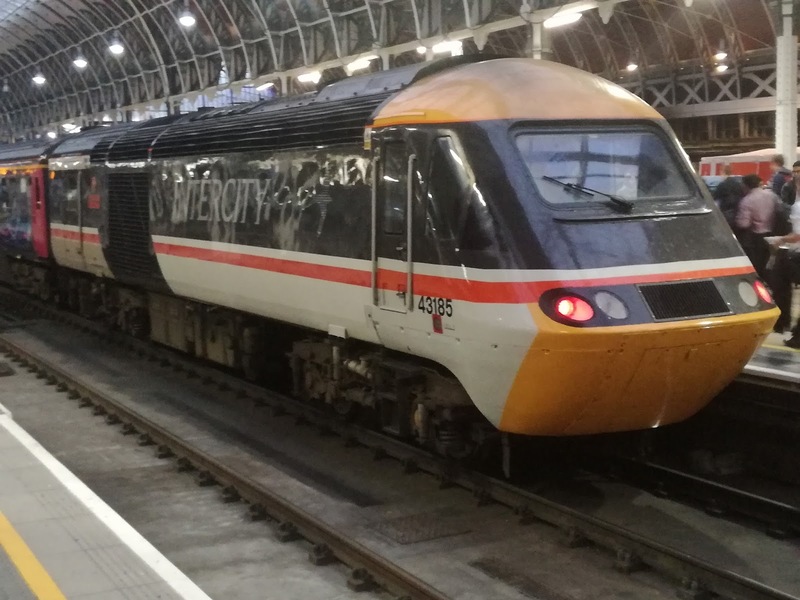 I think it's just a shame VTEC haven't commemorated the HST's in the same way GWR have. A trip to Paddington might be required. I have been reliably informed that Anglian's MAN Ecocity Gas Buses will be withdrawn from service on Saturday 22nd October prior to transfer to Plymouth Citibus. This will therefore be your last chance to ride what I consider (and I'm not alone) the best single deck buses ever seen on these shores before a long journey is necessary. There will, of course be at least one commemorative post. On Saturday I travelled to Peterborough in the hope of meeting an acquaintance who was down for a Diesel Gala on the nearby Nene Vallley Railway. Alas the meeting never materialised, and let's face it after sitting in the cab of D6757 the other night I had no need of a Diesel Gala at a railway that actively publicises its dislike of people just coming to take pictures. I'm not a rich man so sod them! Anyhow I had decided to split the day into two, first half trains and second half buses. However I'll concentrate on the buses this post as there is precious little happening in the bus world at the moment. 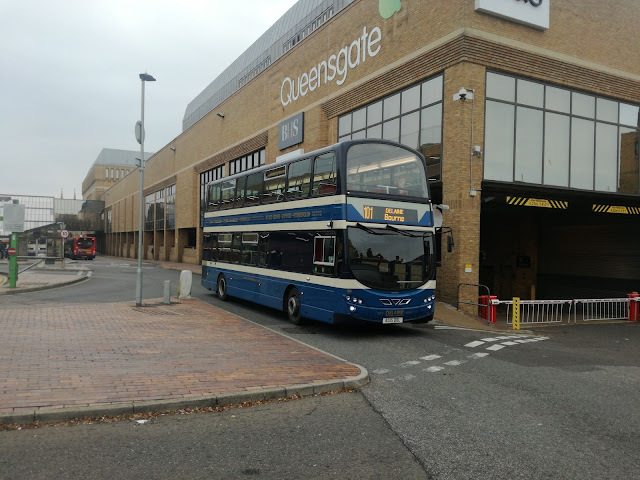 Unfortunately Peterborough is also in the bus world, and frankly it makes Ipswich look interesting. If E200's and E400's are your favourite - old models mind you as MMC's have yet to find their way there - then you will be in mundane Heaven. However I had chosen the right day to go for something totally unexpected and very welcome. I had seen from the railway station some bright yellow Olympians frequently crossing the bridge over the tracks and when I had finished my business on the station one of them was parked outside the station on a free shuttle service to I presumed the NVR for the Diesel Gala. I was wrong. 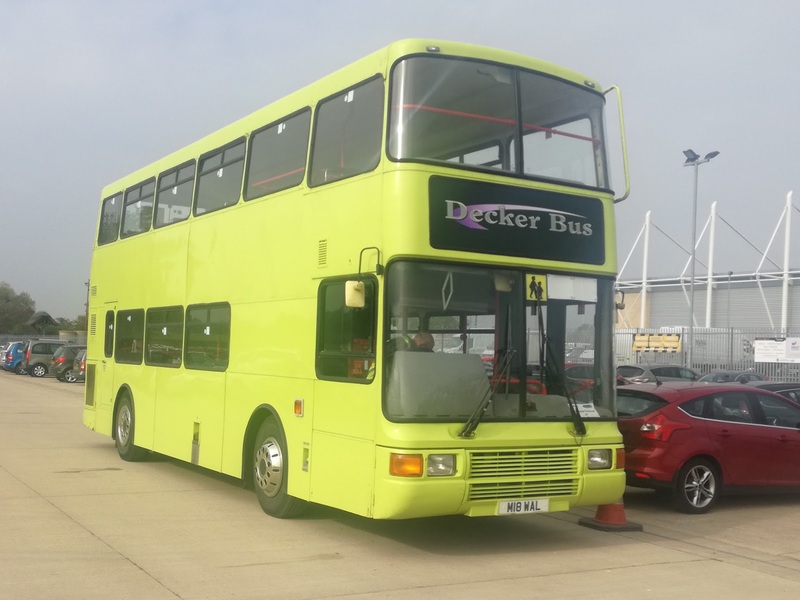 It was further than that so I had a much longer than anticipated ride on Decker Bus of Whittlesey M18 WAL which turns out to not be an Olympian but a DAF DB250 with Northern Counties Palatine body. 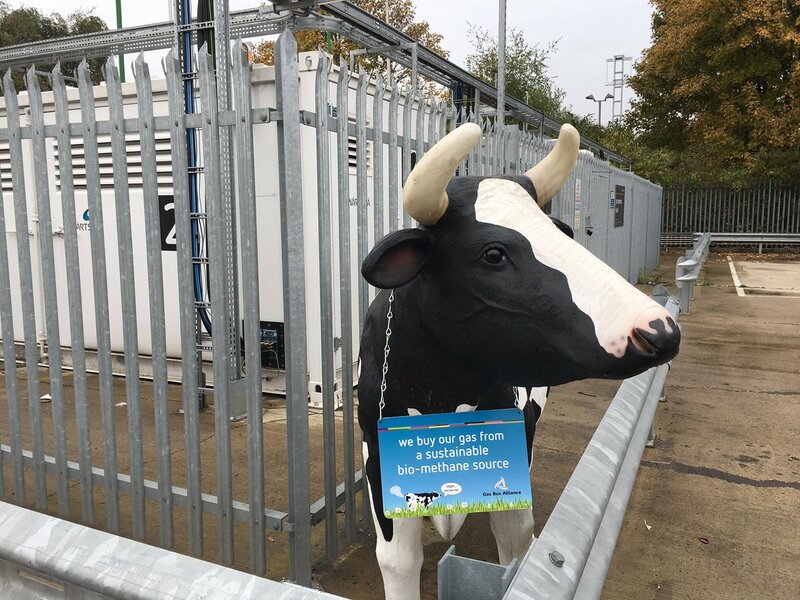 New to Walls of Sharston, hence the registration, this Olympian lookalike, soundalike and ridealike took me on a mystery tour ending up at the East of England Showground where the horror of all horrors was taking place. I confess I am not into models of any description. I prefer the real article, and if I was to ever have a model railway it would have to be life size. You can probably work out the obstacles in that aspiration yourselves. So to stumble on this was the stuff of nightmares, even more so to see it cost a tenner to get in! I'm a full size train enthusiast - get me out of here! I had to get out of there fast and luckily within a few minutes a genuine Olympian had arrived, and one of my favourite types too. With Christmas looming I may as well do some hinting - if anyone would like to buy me an ex Dublin Bus Olympian I'd really be very grateful! T570 EGB was new to Dublinbus as 99-D-539 and those Alexander RH bodies are just superb, silent and strong as Alexander bodies used to be before molded plastic infected them. Add a friendly chatty driver and a perfect combination was formed. Back to Peterborough and the bus station in what had turned into a very dreary afternoon. First spot was Great Yarmouth, or is it Lowestoft these days - never know where the X1 Enviros are actually allocated to these days - 33821 which is on loan to Kings Lynn as a lot of the E400's are now showing the strain of being on a route totally unsuited for them and breaking down with monotonous regularity. Pretty sure someone predicted that around 3 years ago. In case you're wondering no there doesn't appear to be an AD16 DBL! Anyhow apart from that it was all Stagecoach E200's and E400's. 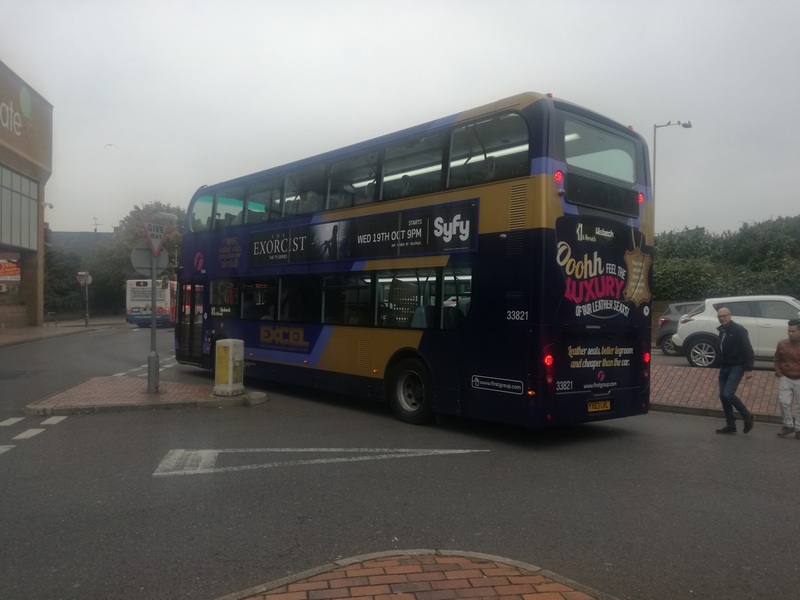 Even the Stagecoach Gold service X4 to Milton Keynes was operated by 61 reg E400's. So I gave that up as a lesson learned and headed back to the station. Sorry Peterborough wasn't more interesting but you live and learn. Might have to try and get to Reading for a better bus & train day. In Part Two my rail activities will be reported, including some old friends of mine.